If I had a pound for every time I’ve been asked “What do you ski instructors do in the summer?”, then I would be able say “I spend most of summer in my St. Tropez villa.” However, nobody seems to be coughing up for this ‘pound a time’ deal, and my international jet-setting has been limited to Gloucestershire, then in Poland, onto Edinburgh for my stag-do, and now back in Stroud to get an MOT, a dental check-up, and chill with my family before my summer work of chairlift construction begins. I should probably mention that the beer is mine. 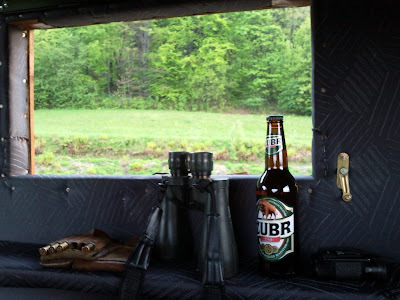 Hubert, my guide to hunting isn’t allowed to drink when he’s responsible for a firearm. I’m allowed a beer because I only get to hold the binoculars. Although we did see some boar later, they were females who cannot be shot in the springtime, so there was no boar’s liver for dinner. Hubert said he often goes out hunting and see’s nothing at all so it sounds like I was pretty lucky. The latest from my summer boss is that chairlift construction is postponed until early July so I may be back in Poland within the next couple of weeks. This entry was posted in Off-season Updates on June 1, 2010 by Rorie.